The IDENTIGENE home paternity test kit is now available for purchase at Save Mart stores in California and Nevada. A paternity test with IDENTIGENE, the #1 brand in America, provides100% accurate, completely confidential paternity results in just two business days. America’s #1 DNA home paternity test kit is now available for purchase at Save Mart Supermarkets in California and Nevada. A paternity test with IDENTIGENE, the #1 brand in America, provides100% accurate, completely confidential paternity results in just two business days. 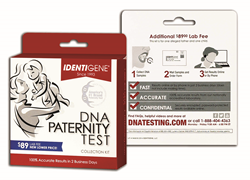 The IDENTIGENE DNA Paternity Test Kit provides an affordable way for families to obtain fast, accurate and confidential DNA paternity answers. 100% accurate results are available online or over the phone two days after samples arrive at the laboratory. IDENTIGENE, located in Salt Lake City, is a global leader in genetic testing, providing personal and legal paternity tests as well as other relationship testing such as grandparentage, avuncular and siblingship tests. The Salt Lake City laboratory is one of the most highly accredited in the world. The IDENTIGENE DNA Paternity Test Kit provides everything needed to collect DNA samples in the privacy of home, and a postage-paid envelope in which to mail samples to the IDENTIGENE laboratory. To locate a Save Mart near you, click here. IDENTIGENE is America’s #1 brand for DNA paternity testing and is a global leader in the industry, providing personal and legal paternity tests and a variety of relationship testing for clients around the world. IDENTIGENE, the first company to bring DNA paternity testing to the general consumer through major drugstores, grocery stores and supercenters, is nationally and internationally accredited for both DNA paternity and molecular diagnostic testing services. IDENTIGENE is a privately-held, wholly-owned subsidiary of Sorenson Genomics, which is a highly accredited genetic laboratory renowned for its expertise in human identity, forensics DNA testing and population genetics. Visit the DNAtesting.com website for industry-leading resources, including how-to videos, a store locator, customer reviews and more. Connect with IDENTIGENE on Facebook or follow the company on Twitter at @Identigene.